A DuPont Pioneer leadership delegation visited CIMMYT HQ on 12 May, 2017. 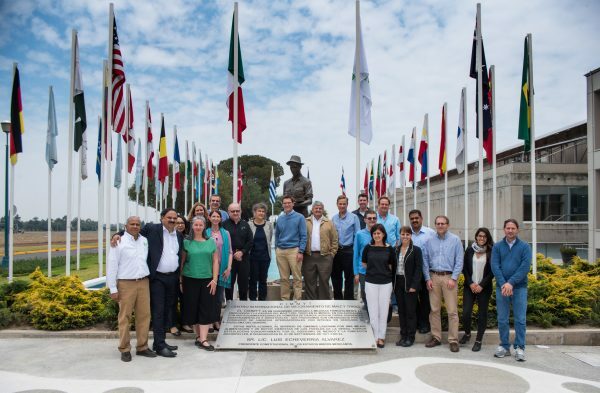 EL BATAN, Mexico (CIMMYT) – A DuPont Pioneer leadership delegation visited CIMMYT HQ on May 12 to explore public-private collaboration approaches within the new CGIAR Excellence in Breeding Platform (EiB). The high level delegation, included Geoff Graham, Vice President of Plant Breeding, and other members of management from Global Breeding & Marker Technology Field Technology Innovation & Operations, and Africa, and Latin America regional operations. The team got acquainted with the EiB through interactions with CGIAR scientists and a tour of the CIMMYT scientific facilities. The visit focused on mutually beneficial collaboration that would enable CGIAR and DuPont Pioneer breeding programs to better capitalize on each other’s experiences, and strengthen knowledge sharing in the pre-competitive domain. The ultimate aim is to improve public and private breeding programs targeting the developing world, including for crops with lower private sector investments. This visit is the latest in a series of new public-private collaborations with DuPont Pioneer. During CIMMYT’s 50th anniversary celebrations DuPont Pioneer and CIMMYT entered a Master Alliance Agreement to jointly develop improved crops using CRISPR-Cas advanced plant breeding technology for characteristics that address the needs of smallholder farmers around the world. The Excellence in Breeding Platform is one of three new platforms within the new CGIAR portfolio. Drawing from innovations in the public and private sector, the Platform will provide access to cutting-edge tools, services and best practices, application-oriented training and practical advice with the intention to modernize breeding programs targeting the developing world. CIMMYT has been selected by the European Space Agency to have access to the pilot version of the Sen2-Agri processing system and receive training on its use. CIMMYT is actively taking advantage of solar energy’s potential in Mexico.